Kindness is a quality of a Muslim. When a Muslim is kind, his personality is beautiful and people are drawn to him. But if he is unkind then it will show in his personality as well and people are repelled by it. 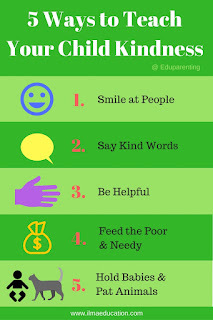 Being kind is very important as we are commanded by Allah to be kind and advised by the Prophet, peace be upon him, to be kind (I’ve provided Qur’an and ahadeeth quotes in other articles, see A Muslim parent is kind and merciful and Be kind to your children challenge ). As Muslims, we want to be kind and want our children to be kind as well. If you want to be a kind parent then read ‘Be Kind to Your Child Challenge’ from the link above or join my ‘Better Muslim Parenting Program’. 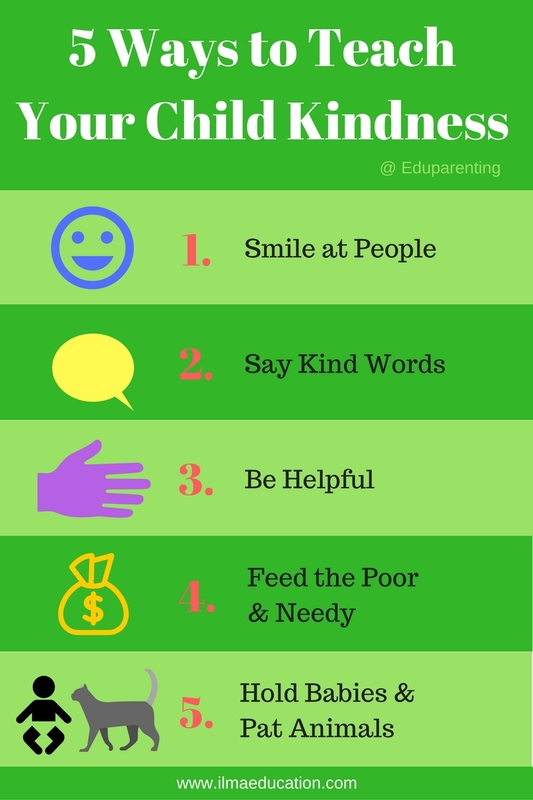 For teaching your child to be kind, then there are five things that you can teach your child to do. Smiling is a kindness because it shows people that you’re friendly and accepting of others. Contrast this with a frowning face that drives people away. Teach your child to smile at others. If your child is young then teach him to smile at family members, relatives, friends and other children. Simply remind your child to smile when he’s about to meet someone. Words can have the power to hurt or heal. Teach your child to say only good or kind words. If he doesn’t have kind things to say then he should remain silent. An exercise that you could do after your child has met someone is to ask your child what are some things that are nice about that person. Then the next time when you’re about to meet that person again, remind your child some of the things that he thought was nice about the person and then encourage him to tell one nice thing to the person. When you do this regularly, your child will begin to look for the good in others and won’t be shy to say kind things to them. Helping others is one way to teach your child to empathise and be kind. Find opportunities for your child to help you and different people too. 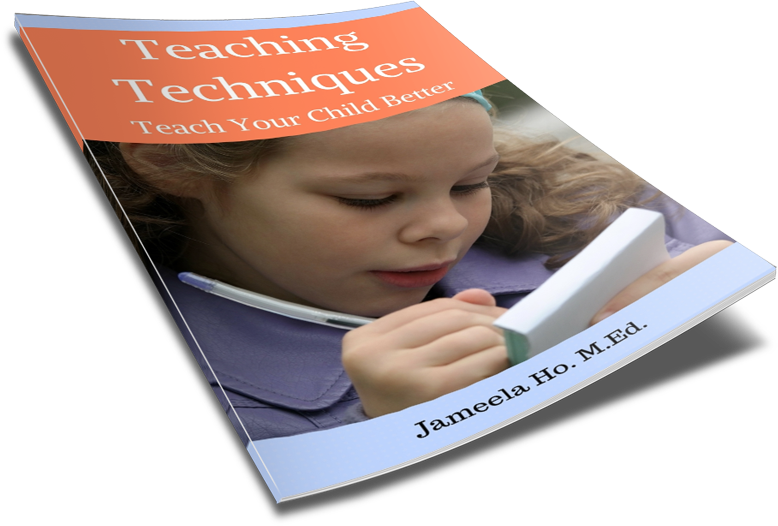 Teach your child to ultimately ask himself the question, “What does this person need? And how can I be helpful to this person?” whenever he sees someone and then to act on it if it’s within his capabilities. One way to teach your child to be helpful is to discuss about sick children in hospitals. Ask your child what he thinks children in hospitals need? Is it toys to cheer them up and someone to talk to? If this is the case then encourage your child to make some toys such as stuff animals to take to the hospital to give and have a chat. Another way is to volunteer at a charitable organisation and take your child along and give him some responsibilities to help out. If he’s old enough then ask him to volunteer at an organisation of his choice. Feeding and helping people less fortunate is also another way to help your child to empathise and be kind. If it’s not possible to have your child help out in a soup kitchen or to deal directly with the needy or poor then get your child to do odd jobs to earn money and then select a sadaqah project to donate a portion of his earnings. The key here is to earn money for odd jobs from you or relatives and friends and not from his chores. If your child is young then you can give him the money and have him select a charity to give it to. Make sure that he can see the photographs of the people that he’ll be giving to. This will make it more real to him then just dropping the money in a money box. Being gentle with babies and animals teaches your child to be kind to those weaker than them. Young children are usually discouraged from touching babies for fear of the babies being hurt by them while teenagers often shy away from holding babies for fear of not knowing how to. Take every opportunity to teach your child, whether young or old, to handle babies gently and the way to hold them. If it’s not possible for you to keep pets then take your child to the farm to touch baby animals or give your child horse riding lessons.